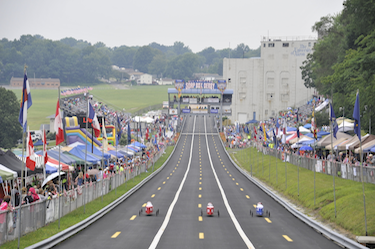 AKRON, OHIO, July 17th, 2014 – America's iconic FirstEnergy All-American Soap Box Derby holds its 77th annual World Championship finals at Derby Downs in Akron, Ohio on Saturday, July 26th – and characters from the Boxtrolls movie will be joining the fun, even racing down the track in their own custom-built car. 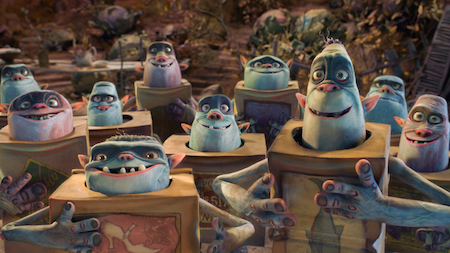 Focus Features, which releases LAIKA’s family event movie The Boxtrolls nationwide on Friday, September 26th, is partnering with the International Soap Box Derby and inviting families attending the World Championship to explore the fantastical world of The Boxtrolls as an official sponsor of the FirstEnergy All-American Soap Box Derby. At Derby Downs all day Saturday before the final races, fans will be able to meet the Boxtrolls, view the custom-built car on display, get free Boxtrolls gear, check out exclusive sneak preview clips from the new movie, and enter the Boxtrolls’ fantastical home environment with an immersive photo experience. Following the day's interactive activities, quirky, mischievous creatures Fish, Shoe, and Sparky - in a racer powered by gravity and steered by the Boxtrolls themselves – will make their inaugural run on the speedway course in an exhibition race just before the Derby finals, with thousands of fans cheering the group across the finish line. During the week-long festival, interactive experiences will include Boxtrolls surprises at the Monday, July 21st “Rock the Rec” event and the Thursday, July 24th “Topside Show,” at which the stunning custom-built soap box car from the world of the Boxtrolls will be unveiled. The Boxtrolls join a long line of special guests at the Soap Box Derby in Akron who have included Presidents Nixon and Reagan, Academy Award winners James Stewart and Tom Hanks, and NASCAR legend Dale Earnhardt. Thousands of local fans and visitors cheer racers from around the world who compete in a variety of divisions, integrating science, technology, engineering, and math into an educational curriculum and event series. Called “the greatest amateur racing event in the world,” the Soap Box Derby is the preeminent youth racing program, with the World Championship finals held each July at the world-famous Derby Downs in Akron. Girls and boys, ages 7-18, from throughout the U.S. and several foreign countries bring the racers they have built and driven to victory in their home communities. The first youth Soap Box race in the U.S. was organized in 1934 by a Dayton-based newspaper photographer who expected 19 kids to compete. Instead, a staggering 362 kids showed up with homemade cars built of orange crates, sheet tin, wagon, and baby-buggy wheels to compete in what was to become the first Soap Box Derby. The sport raced into its heyday over the next several decades, with Boys’ Life reporting in 1959 that 3,000,000 people participated in some form of derby activity each year, including over 160 local derbies and the annual All-American in Akron. For more on the Soap Box Derby and its history, visit www.AASBD.org and read the article at http://www.ohio.com/news/soap-box-derby/75-facts-about-the-all-american-soap-box-derby-1.320480. Opening nationwide Friday, September 26th, The Boxtrolls (www.TheBoxtrolls.com) is a family event movie from LAIKA, the creators of Coraline and ParaNorman, that introduces audiences to a new breed of family – The Boxtrolls, a community of quirky, mischievous creatures who have lovingly raised an orphaned human boy named Eggs (voiced by Isaac Hempstead Wright of Game of Thrones) in the amazing cavernous home they’ve built beneath the streets of Cheesebridge. When the town’s villain, Archibald Snatcher (Academy Award winner Ben Kingsley), comes up with a plot to get rid of the Boxtrolls, Eggs decides to venture above ground, “into the light,” where he meets and teams up with fabulously feisty Winnie (Elle Fanning of Maleficent). Together, they devise a daring plan to save Eggs’ family. Based upon the book Here Be Monsters, by Alan Snow, The Boxtrolls is directed by Anthony Stacchi and Graham Annable and is MPAA-rated PG.